I know from hanging out with two-leggers that your species is a very intelligent one, even if you have difficulty communicating in Dog. For the most part that isn’t a great problem as we dogs are pretty adept in understanding our two-leggers, and many of us are fortunate enough to be able to make ourselves understood by all but the most dense two-leggers out there. You’ll forgive me for being frank… If you think about it for a minute, you’ll see I am right. I’m pretty fortunate to have a two-legger that pays a lot of attention to me and who understands what I’m trying to communicate to her pretty well. Even so, putting forward my creative side in a world manufactured for the benefit of the two-legger population presents some pretty extreme challenges. To demonstrate, in a world with more than 400 million dogs, how many dog bloggers are there out there? I think you’ll find the numbers prove my point. It isn’t because we lack intelligence. It isn’t because we don’t want our voices to be heard. Nope. I think it’s mostly because our two-leggers, as intelligent as they generally are, just don’t have the time, energy or patience to really get to know us, their dogs. Their idea of communicating to us is simply to tell us what to do and give us a cuddle or a scratch behind the ears once in a while. We’ll take what we can get. That’s how we are – we’ll love you and any little bit of you you are willing to give us. But we really want to communicate with you. We want to share our day with you. We want you to understand us and revel in the world we see around us – something, quite frankly, we think you’ve lost sight of, most of you. You are – all of you – to chained to your two-legger inventions. You’ve made life so complicated that you are missing out on a lot of the finer things in life, like a good run in the woods; a dive into a snowbank after sitting in the heat of the house for too long; time spent just revelling in the scent, the sounds, the tastes of the world around you; time spent with your best friends and family just listening to them, talking to them – just being with them. That’s it: you two-leggers need to spend more time being instead of time doing! Waiting for Boot-up to Finish. I like to work on the blog with Elizabeth on her bed. We can both see what's happening on the screen then, and I can help her choose pictures. Say - that's Kay on the screen - taken when she was a little two-legger perched on her daddy's Model-T. She's watching for rocks as they ford a creek. I have a soft spot for little two-leggers. They're so cute, and they love to play! Elizabeth isn’t perfect. She’s got a lot of preoccupations that she ignores me for. I put up with that because I love her. And she really does try to give me some special time often through the day. She helps me with a lot of things, too – like when I’m in trouble or pain or sick. 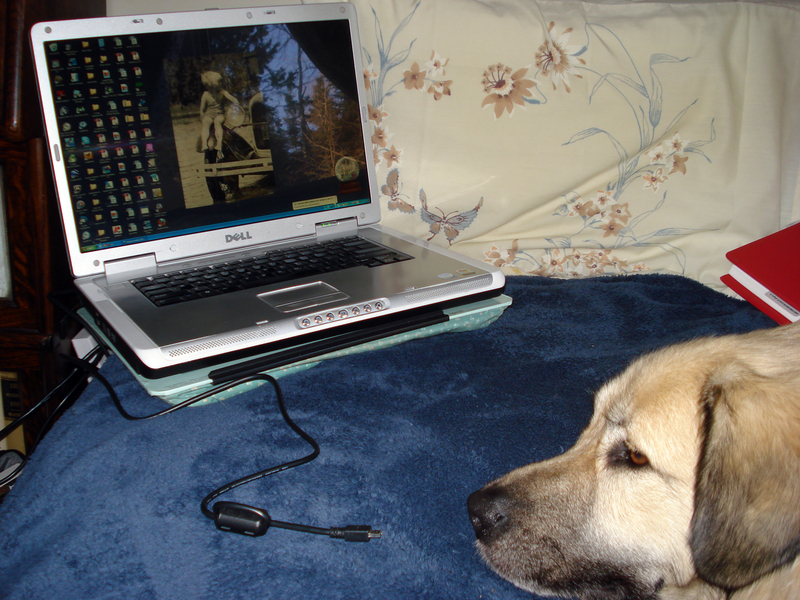 She helps me blog and show my creative side, too. And I know I’m pretty blessed, even if life isn’t exactly what I wish it was with her and Kay. Some of the dogs I meet have had it much worse than I! I guess that’s part of why I get Elizabeth to help me write this blog. I’d like to show you two-leggers that we aren’t just silly energized balls of fluff made to hang onto your every word and gesture. We have so much more to offer you! If you haven’t discovered that yet, please… take a little more time each day to ask your dog pal what he or she would really like right now, and listen. Listen with your eyes, your ears, your intuition. Your buddy Rover will take you along on some fine adventures if you dare follow!